This work is homage to Mother Easwaramma the source of Love, Strength and Pillar for the women-folk of our country. 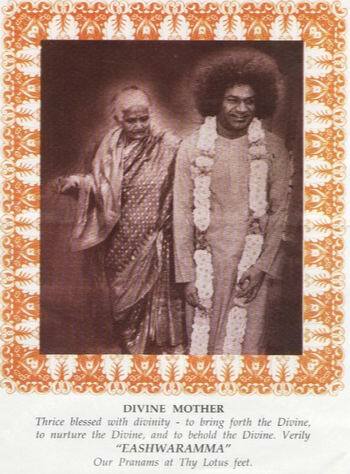 EASWARAMMA-THE CHOSEN MOTHER - book is a befitting tribute to the life of Easwaramma whom Bhagawan Sri Satya Sai Baba the God incarnated chose to be His Mother. It provides rare glimpses into her psyche; her curiosity, compassion and wonder. She was tenderhearted and pious and like an earnest sadhak, had to trudge along the inner path that leads from Maya to the Master. This short narrative of the earthly life of Easwaramma ('God's Mother') pictures lucidly her expanding awareness, and delineates hesitations, hazards and hopes that she had to encounter. Naturally simple, meek and modest, she always stepped back from publicity, admiration and adoration. As Mother of the global family of Sai, her love had to be all-enveloping and unconditional. When we review the life of the Mother of the Avatar, we find ourselves progressing through curiosity, expectations, compassion and wonder and landing in appreciation, admiration and adoration. Easwaramma was allotted the well-nigh-impossible task of expanding her awareness beyond the ring of hills, beyond the barricade of tradition and taboo and the wall of custom and caste. Burdened with the prestigious and pardonable pride of the most precious motherhood a woman could aspire to, she could not inspite of consistent effort jettison the homage she attracted from all the continents. Even while in this predicament, she, like any other earnest sadhak anxious to win His Grace, had to trudge along the inner path that leads from multiplicity to unity, from dispersion to concentration and meditation, from egoism to detachment, from passion to serenity, from unconcern to the love that cares and shares, from Maya to the Master. And, all this journey while busy as mother and grandmother in the Raju family as well as in the fast multiplying multi-lingual, multi-racial, multi-cradle, global family of Sai. As Mother, her love had to be all enveloping, all protective and unconditional. It was mainly through the teachings and Grace of Baba that she succeeded in this assignment of expanding and deepening her love. Baba, in His elucidation of Dharma, has revealed that woman represents the concretization of God's beneficence. She has a natural aptitude for spiritual endeavor, being endowed with fortitude, meekness and modesty. She is intelligent and vigilant. She has an innate sense of honor and loyalty to virtue. Easwaramma, as the closet devotee of Sai, was aided by Him to uplift herself to the heights marked out for the ideal woman. Swami has often declared that this Sai Avatar descended because the saints and sadhu of all lands prayed for His arrival. "I chose the mother who wa s to experience my closeness during gestation. The Avatar alone has this freedom of choice. In other cases, karma determines the time and place, the group and the grade," He had said. The mother is the first recipient of the Avatar's Grace. The father, who protects and nourishes the mother, is rewarded with the fame bestowed on his name. When Pedda Venkappa Raju threw off his mortal coil in 1963, Swami wrote a note for the sake of those who lamented the loss of the 'father'. It was published in the "Sanathana Sarathi". "Well, you say that he was a blessed soul since he passed away in the fullness of years without falling ill and incomplete possession of his memory and consciousness. It was not thus alone that he was blessed. These are mere signs and pointers. On the day that he could be known as the 'father' of the Manifestation, on the say that this Manifestation allowed it to be known that he was his 'son', that very day, he was blessed and his life was rendered holy and sanctified. This good fortune can be won by only one individual, in one entire age (Yuga). It is beyond the reach of others." EASWARAMMA- the love with which she treated the women blossomed wider as she watched Swami healing the stricken. He showered Compassion on them and applied vibhuti profusely on their brows. Easwaramma decided that she would not condemn or ridicule any women on the basis of her apparent faults or failings for they were only, she knew, the symptoms of maladjustment or neglect or persecution and poverty. Through which you hear the cry of the weak. Their helplessness calls out your mercy. The devotees discovered in her a never falling source of strength and wisdom. They sought her out more and more often and honored her as the Mother, assigning her distinct roles during festivals and holy days. Easwaramma did not yield as soon as the women surrounded her and pleaded that she should guide them or bless them. But how long could she keep them at bay? On holy days dedicated to the worship of Varalakshmi (the Goddess of Wealth ready to grant boons) or Gowri (the Fair Consort of Siva, mother of Ganesh), she had to accept the first offering of homage from every women who needed her. During the nine days of Navarathri, the Festival of the Mother, she was honored for the first three days as Durga (the smoothener of the path, the provider of safety and security of Her children), in the next three days as Lakshmi (the provider of food, clothing and shelter, status, power and renown) and on the last three as Saraswathi (the Teacher who implants the yearning for learning and for liberation, for material skill and moral strength). "We women must learn more about the world," she sighed. Swami had left Africa after addressing a Guru Poornima meeting there in the morning and had arrived in Bombay in time of the Guru Poornima celebration at Dharmakshetra in the evening, and so it happened! The Guru heard the cry of the Mother on behalf of her daughters. Within a week of His landing on the soil of India, he inaugurated the Sri Sathya Sai Arts and Science College for Women at Anantapur, the Headquarters of the District to which Puttaparthi belonged. "Swami, you have done the right thing! Women must be as well educated as men. When one animal is bold and alert and the other is cowardly and blind, how can the cart to which they are yoked move forward?" She commented. Lakshmidevamma, the Headmistress of the Girls' High School, Anantapur, told her that Swami had promised this College a year ago when He had presided over the High School Day. "I find that the girls who complete their high school have now to go to distant colleges at Tirupati and Kurnool," He had said, "I shall therefore establish a college right here very soon." And so, the girls of Anantapur got a college, a college dedicated to the realization of the universal and constructive ideals of Sathya Sai Baba. The Mother, it must be conceded, was the foremost pupil of the 'son'. She was an exemplary housewife and an unquestioning conformist in the observance of vows, vigils and fasts declared as obligatory in the Hindu calendar. She delighted in visiting holy places, bathing in holy rivers and offering worship at shrines. And like the high cast women of Puttaparthi and other villages, she was loyal to the lawmakers who laid down the dos and don'ts, which should govern daily living and social relationships. Woman has been extolled in ancient scriptures as well as classical poetry as grihalakshmi, the Goddess of Prosperity in the Home. She is the Dharmapathni, the Companion of the Husband in the fulfillment of the Duties and Rights of wedded life as a householder. The Puranas and Sastras stress the role of women as mother and extol the mothers, who instilled high ideals in the minds of the children of the land. The Vedas speak of Maitreyi and Gargi, as great scholars and spiritual heroines. Gargi was revered in the assembly of Vedic pundits for her mastery of the abstruse problems of the spiritual voyage into the heights of self-realization. 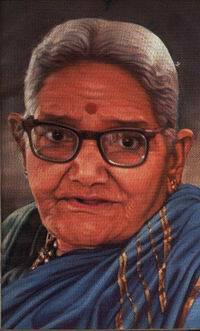 In historical times, we have the mother of Sivaji who fed him on the epics and Puranas, and brought him up, as a brave representative of the best in Hindu culture. What a great inspiration is this Bharathi for all of you! Our Puranas and Sastras, the Upanishads, the Vedas, the lives of the saints and seers of this land contain hundreds of such incidents which serve as beacons to light your path, Lean about them and derive benefit from them. This has always been our Divine Lord Baba's message to the women. With this homage to the MOTHER EASWARAMMA I offer this work at the Divine Lotus Feet of the UNIVERSAL MOTHER SAI on this auspicious day 19th November 2002 on the occasion of Women's Day. Seek His Blessings to accept this compilation of His Mission to be hosted on www.s.a.i.info.